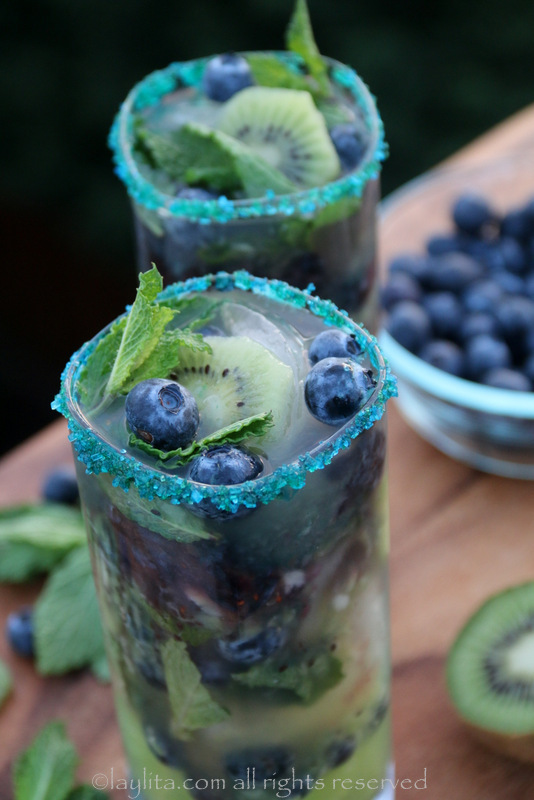 I originally made these kiwi blueberry mojito cocktails for a Superbowl party (Seahawks were playing). 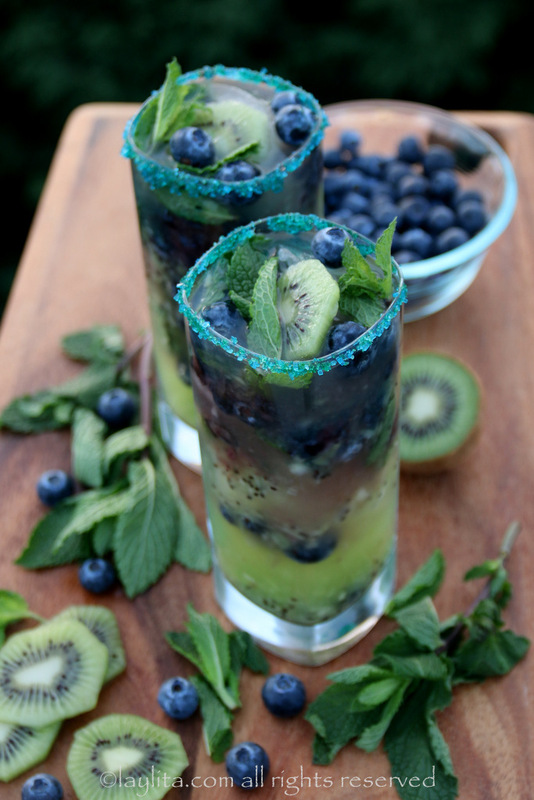 This green and blue fruity cocktail is made with fresh kiwis, blueberries, lime, mint leaves, sparkling water and rum. 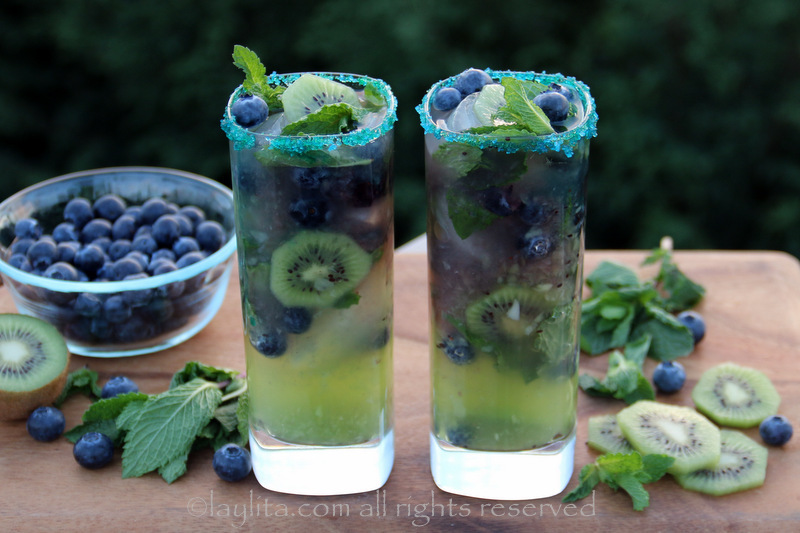 I wanted to make a 12th Man Seahawks inspired cocktail to serve at the party, and as soon as I found kiwis, blueberries, and a big pack of mint I knew it had to be a mojito. I was out of rum and found Pacific Rum (from Oregon) that would be perfect for a Pacific Northwest themed cocktail. 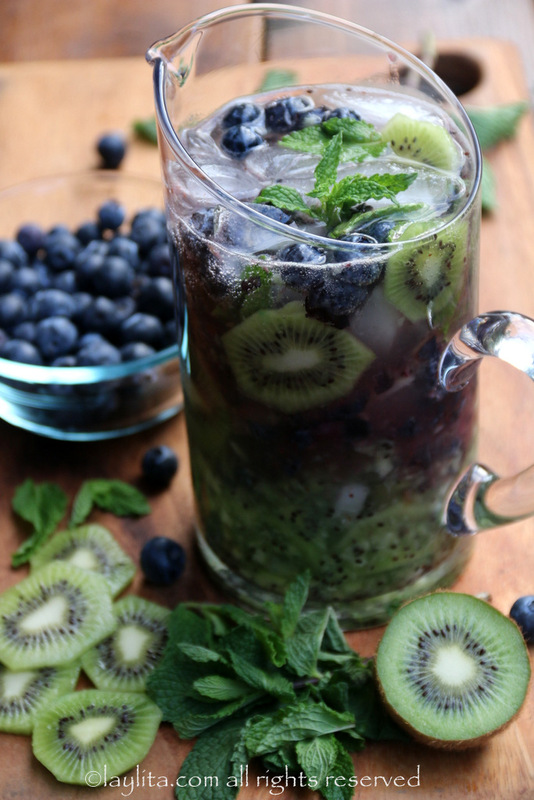 Recipe for kiwi blueberry mojito cocktails made with fresh kiwis, blueberries, lime, mint leaves, sparkling water and rum. 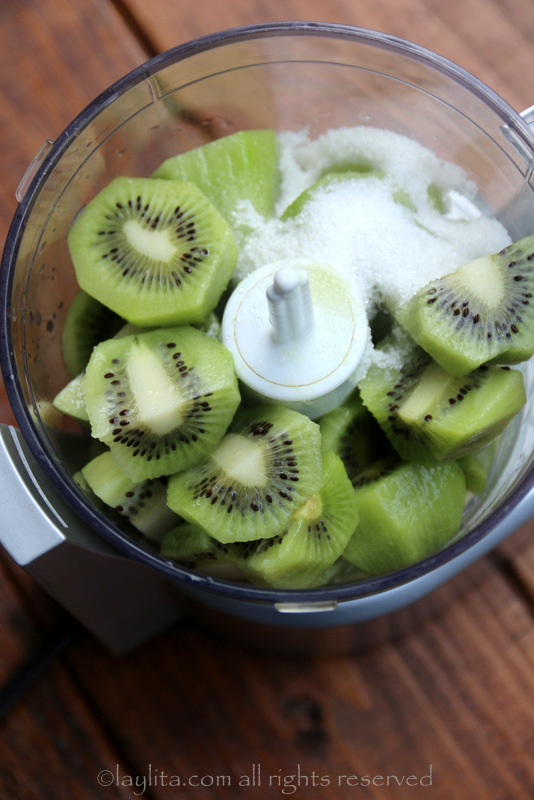 Place the cut kiwis in a small food processor with the sugar and lime juice, pulse until you have coarse puree. 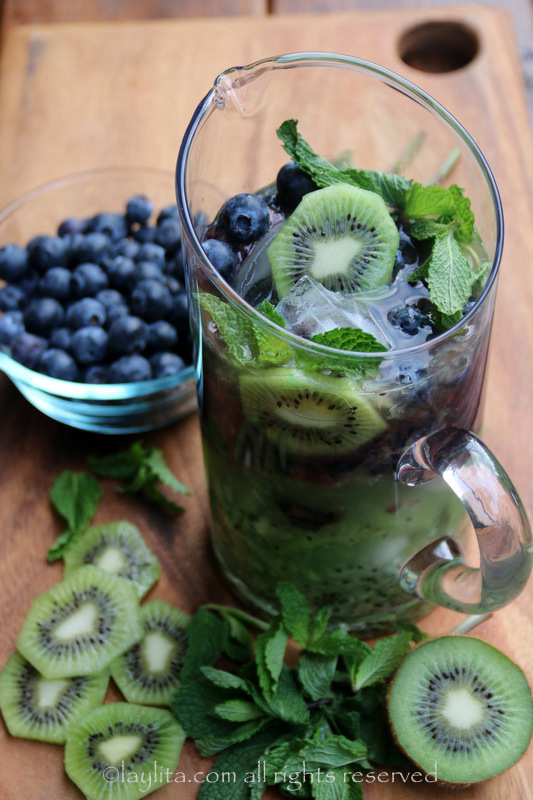 Mix the kiwi puree with the rum, you can start by adding the lower amount and then adjust as you prepare the drink. Gently crush the first 6 ounces of blueberries using a muddler. 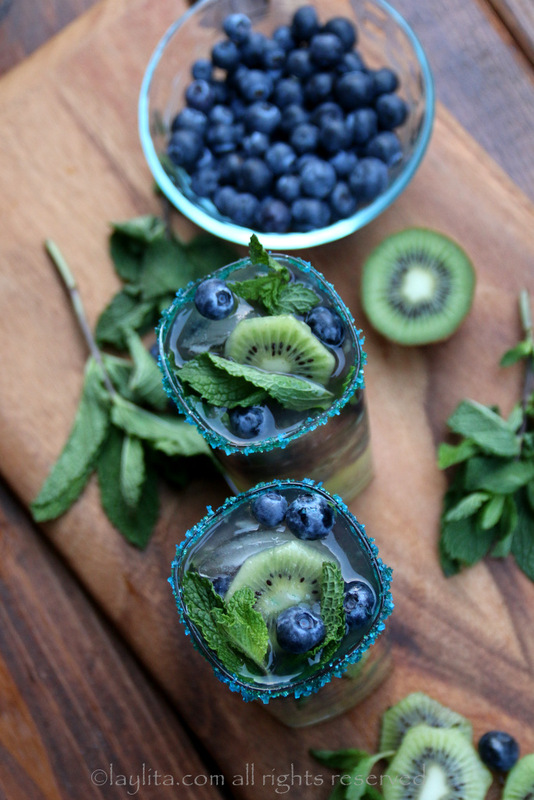 You can make the mojitos in pitcher or in individual glasses. Moisten the rims of the glasses with a slice of lime and garnish the rims with the sugar. If you can’t find blue and/or green sugar, you can use blue/green cookie sugar sprinkles. 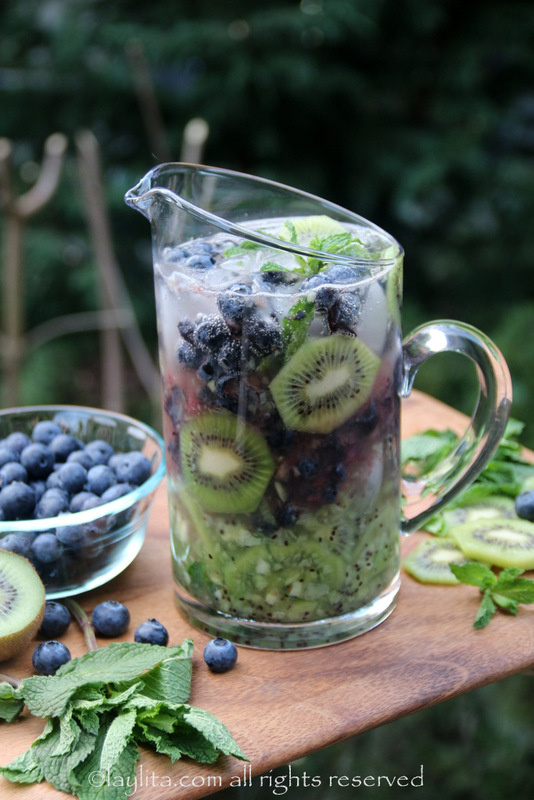 To make it in a pitcher, pour the kiwi puree into the pitcher, add a layer of ice, add a good amount of mint leaves and kiwi slices. 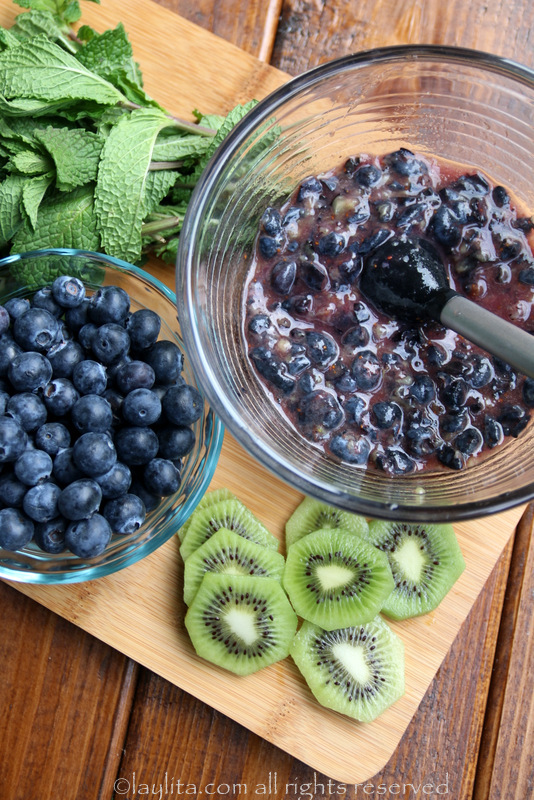 Next add a few more ice cubes, and then add the crushed blueberries, some more mint leaves and whole blueberries. Top off with the sparkling water and mix gently. 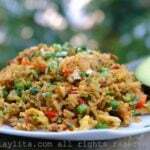 Taste and add more rum, sparkling water, or sugar if needed. 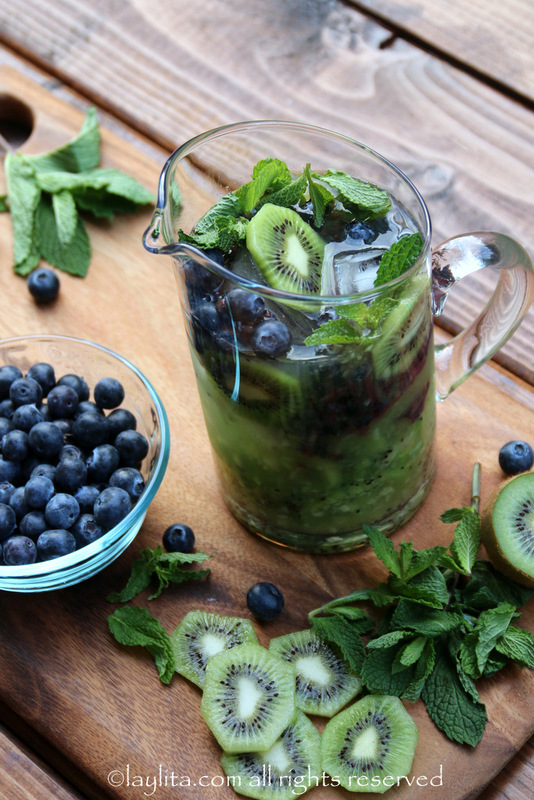 To make the drink in individual glasses, follow a similar process as for the pitcher, but add a few whole blueberries at the beginning. 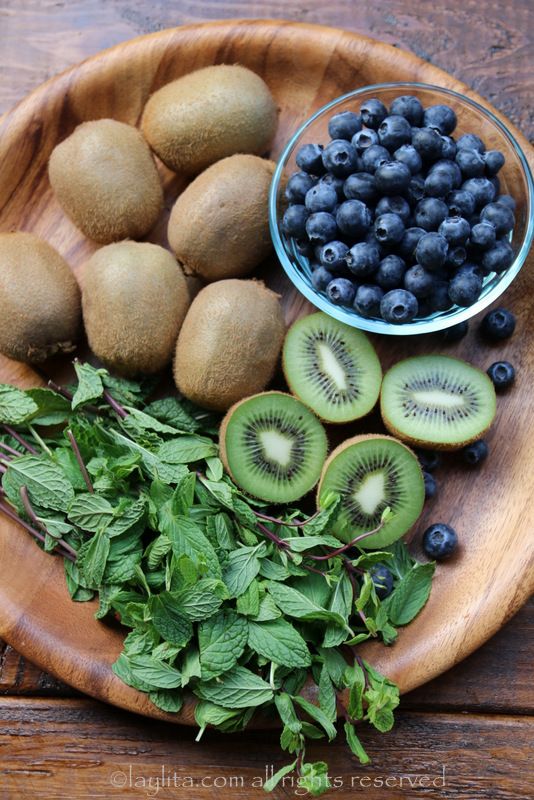 You can also add a slice of kiwi with the blueberries at the end. To make this as a mocktail variation, just leave out the rum and replace it with additional sparkling water or sparkling lemonade. 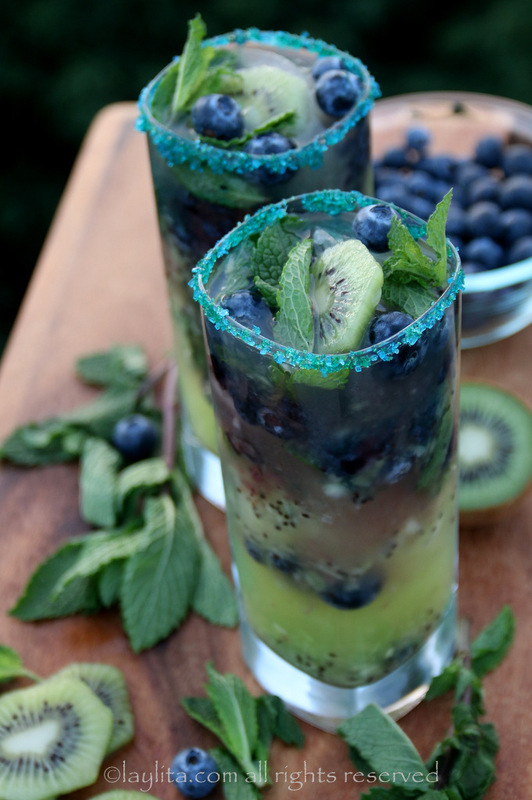 To make this fruity mojito, I used half of the fruit to make the drink and used the other half as garnishes. 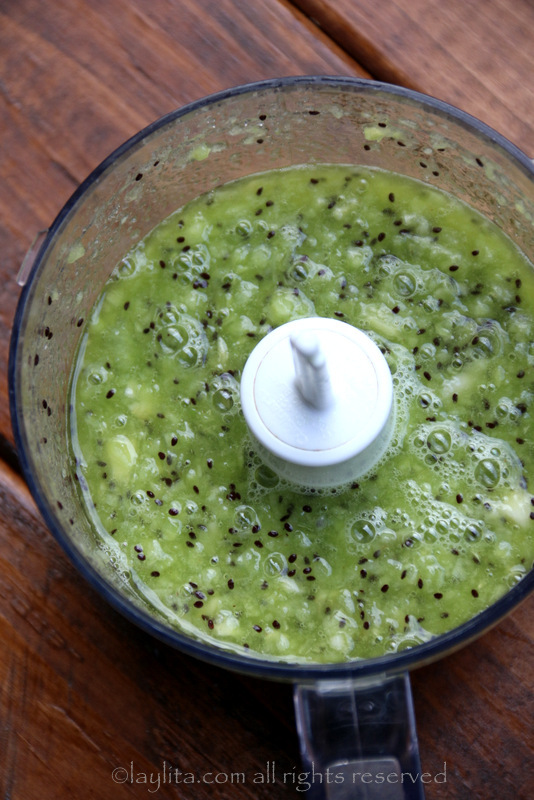 I crushed the kiwis in a food processor; I wanted them to be smooth with a bit of consistency. I didn’t want the blueberries to turn into a purple puree, so I crushed them gently using a muddler. Super Bowl fever has overtaken the Seattle area, this is the first time I’ve experienced living in a city that has an American football team playing the Super Bowl. 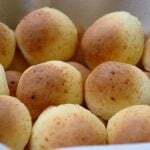 I’ve been a “futbol” (soccer) fan ever since I can remember and am the typical screaming their head off yelling “gooooooooooooooooooooool” (or “arbitro vendido, pito regalado”) soccer fan. The current sentiment in Seattle reminds me so much of the first time that Ecuador ever classified to the World Cup. There’s this excitement in the air, everyone is wearing green and blue, it’s almost more exciting than Christmas! Of course, there are some differences, people aren’t driving around honking their horns (as we do in Ecuador when our team wins or classifies), and I don’t ever remember experiencing a major Skittles shortage in Ecuador. 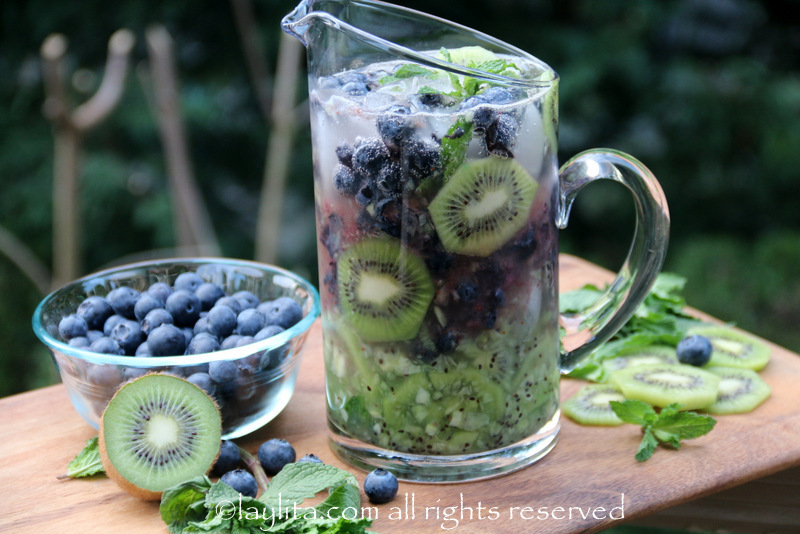 I like my mojitos to be full of mint leaves, so I usually use a large 4 oz pack of mint for a pitcher of mojitos for 6-8 people. However, it’s not always easy to find large packs or bundles of mint, so you can use less in that case. 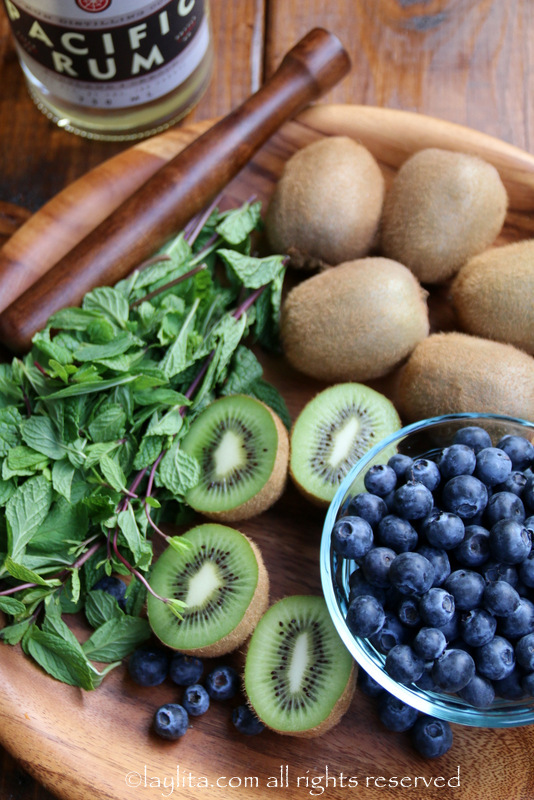 I don’t like to crush the mint leaves when I make fruity mojitos (but will do so for classic mojitos); they give enough minty taste to balance out with the fruit without having to crush them. The amounts listed for sugar and rum are based on my preference, so feel free to adjust based on your preference. I tend to prefer drinks that aren’t too sweet so my sugar proportions are on the lower end. You can also replace the sugar with honey or your choice of sweetener, or if the fruit is very sweet you can also leave it out completely. 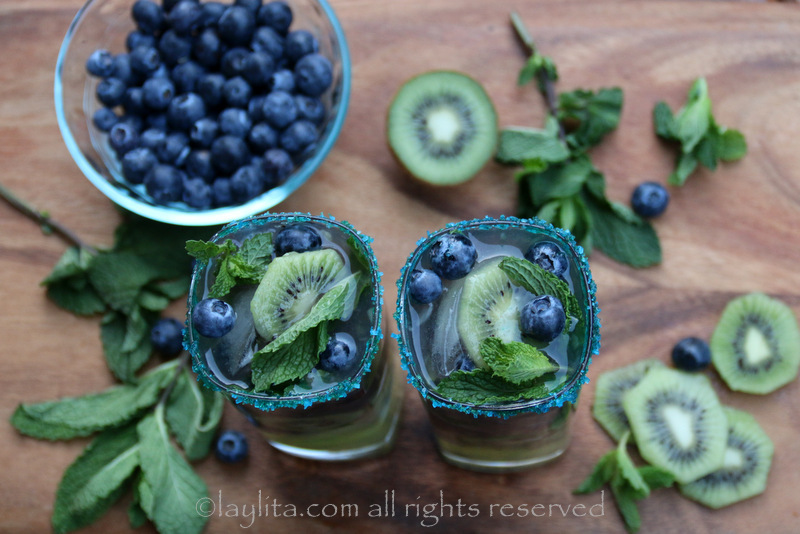 My kids are so happy about the Seahawks, so obviously I had to also make a mocktail variation of this drink so that they could celebrate. 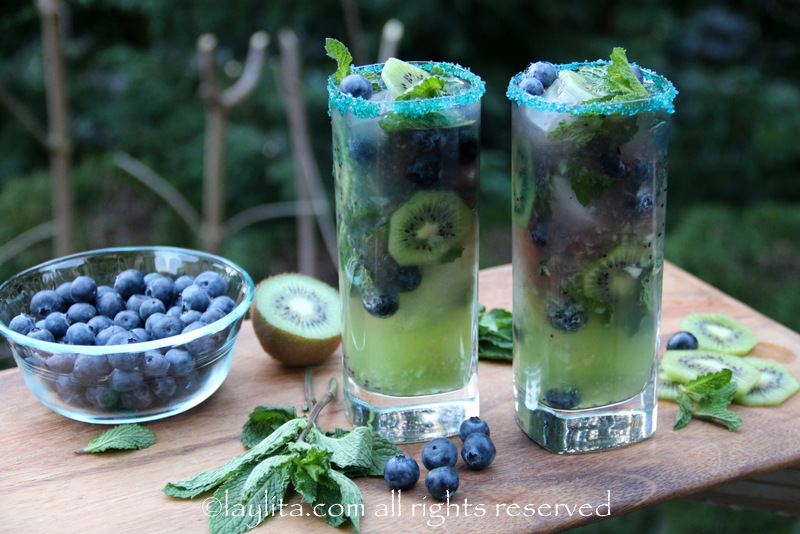 This kiwi blueberry mojito is very easy to turn into a mocktail, just leave out the rum and you will have a yummy kiwi blueberry mint mocktail for the kids or anyone that doesn’t drink alcohol.